DVD release for the '90s Doctor Who spin-off. A welcome reissue, the sincerely made Mindgame isn’t about to disappoint any Whovian, featuring the sort of lovably ropey effects, strong characterisation and earnest pop-philosophising the actual telly show is renowned for. There’s a wonderful loophole inherent to the Doctor Who franchise (previously discussed here and here) which means that, thanks to the BBC’s convoluted copyright laws, the Big British Castle didn’t legally own the rights to many of the auxiliary characters which featured within their Doctor Who programme, allowing independent parties to license them directly from the creators. 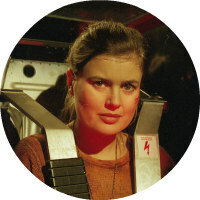 This gave way to a slew of unofficial direct to video one offs and novels featuring, among others, the supplementary figures of Sarah Jane, the Yeti and, in Mindgame, Sophie Aldred’s Ace. Of course, much like the original series itself, these spin offs varied in quality, but the definitive consequence was an intricate, interlocked and expanded multi-media universe the expansive likes of which Marvel or DC fans could only dream of, as it was, in fact, partly constructed by the fans themselves. A welcome reissue, the sincerely made Mindgame isn’t about to disappoint any Whovian, featuring the sort of lovably ropey effects, strong characterisation and earnest pop-philosophising that the actual telly show is renowned for (although I don't recall the show having a score which was as dreamily lovely as the one Mindgame has...). 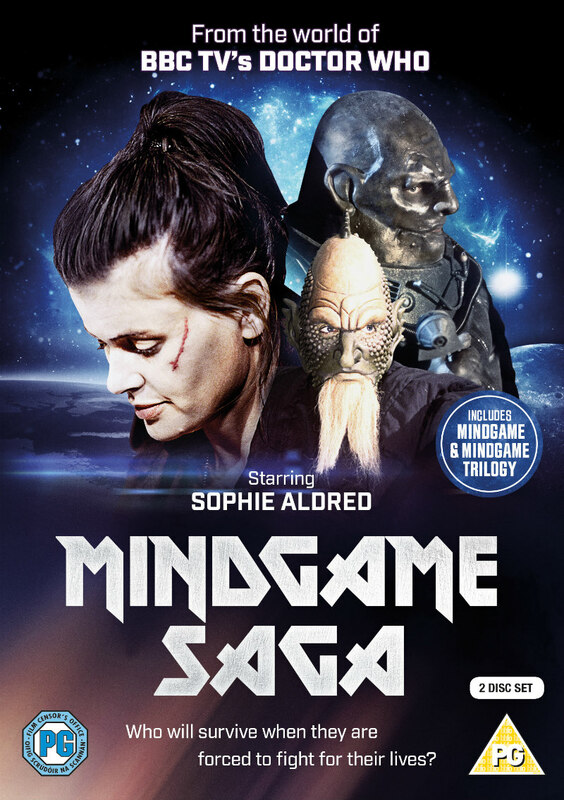 Following on from the 30 minute Mindgame, Reeltime also include the short’s sequel, The Mindgame Trilogy (again directed by Barnfather but featuring a different writer each time). This is a rather bittersweet triptych wherein we discover the eventual fates of our star-crossed trio (SPOILER) after they escape from the prison featured in the prequel. Each character is afforded a separate 20 minute-ish epilogue, beginning with a Dicks penned adventure featuring the Sontaran (this time almost unrecognisable as he’s played by a different actor, John Wadmore). Although the setting of a war torn Sontar is atmospheric, this short released a year or so after the original has the thankless task of recapping the events of the film you’ve probably just sat through only a few moments earlier. Still, it sets the mournful tone for what is essentially three monologues focusing on the nature of conflict, of life and of death. The second segment features Richardson’s Draconian, again stuck in a cell, but this time for a crime against his society. This part of the trilogy is great fun, with the Draconian’s soliloquy consisting of heavily laboured literary allusions intoned in a pleasingly booming luvvie register (Richardson also wrote it, and is clearly having great fun). The last act moves from existential camp to something darker, where Ace is marooned in space due to the engine failure of her fighter ship. Aldred is amazing in this Roger Stevens written segment, which slowly descends from a happy-go-lucky adventure to perhaps the most harrowing memento mori to camera pre-Blair Witch Project. In the 20 minute section, Aldred’s fighter ranges from perky optimism to utter despondence in an anachronistically emotive performance (and, yes, it isn’t hard to understand why the older blokes in the comic shop still harbour such a crush on her). This idiosyncratic performance juxtaposes what has preceded it, and throws the otherwise adventurous tone of The Mindgame Saga into trivial relief; it’s like something from outside of the more family friendly Doctor Who remit, a drama that ascends the generic context (Aldred swears twice in the film, in dialogue that is appropriate but unexpected: both times you really feel it!) It is a feature of such forthright quality that it upsets the average, and makes summatively assessing this otherwise playful sort of product tricky. Nonetheless, with these films made for the fans and by the fans, the defining measure should be, will the fans enjoy it? With a series of features as fun, exciting and heartfelt as The Mindgame Saga, who among them could not? Now this is the real selling point. TARDIS-like, this small disc holds an extensive wealth of treasures inside, with the ' Making of' both Mindgame and The Mindgame Trilogy, a Mindgame Saga Retrospective, the Mindgame script (which includes missing scenes suggesting some sauciness between the Draconian and Ace - oooer!) along with a couple of slideshows. These extras may well have been put together using a sonic screwdriver as they are riveting (I'm here all week!). For one thing, I'll never get bored of seeing backstage thespians in elaborate monster make up attempting to do simple tasks like eat/turn their head. But these extras also provide a very candid account of these pressured and at times troubled productions. For example, that 'chewable' scenery of Mindgame? Made the day before! With interviews from all involved, you get the inspirational sense of passionate craftspeople working hard together to make a film that they can be proud of, and that is worth adding to the Who mythos. In these detailed documentaries we see tempers frayed, upfront honesty about the films' flaws, and also the usual larking about: it's a provincial Heart of Darkness. As a bonus, Richardson narrates the making of The Mindgame Trilogy with warmth and wit. At certain points he even seems to think he is the Draconian! A joy.